WTI crude prices are in the range of $47.50/b-$48.00/b this morning. Prices have been fairly stable, holding to Wednesday’s gains. WTI opened at $47.81/b today, an increase of $0.42, or 0.89%, above yesterday’s opening price. Current WTI prices are $47.83/b, unchanged from yesterday’s closing price. 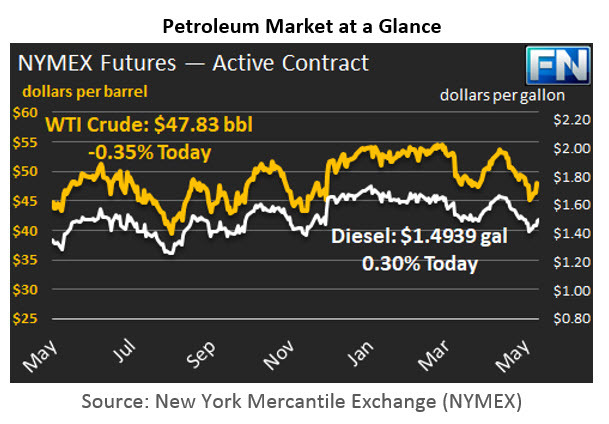 Crude and product prices surged on Wednesday, and they have traded in a narrow range since then. Despite this week’s recovery, prices remain roughly where they were in November, prior to OPEC making its historic production cut deal. Since April 12th, WTI crude prices have opened lower in thirteen of the last twenty-one trading sessions, falling by 10% ($5.59/b) since then. Diesel opened at $1.49/gallon in today’s trading session. This was an increase of 1.35 cents (0.91%) above yesterday’s opening price. Current prices are $1.4939/gallon, up slightly by 0.4 cents from yesterday’s closing price. Diesel prices have opened lower in sixteen of the last twenty-one trading sessions, shedding 16.45 cents, or 9.9%, since April 12th. Gasoline prices opened today at $1.567/gallon, an increase of 1.5%, or 2.31 cents, above yesterday’s opening price. Prices are $1.5753/gallon currently, up 1.31 cents from yesterday’s close. Gasoline prices have opened lower in fifteen of the last twenty-one trading sessions, dropping by a total of 19.69 cents, or 11.2%, since April 12th. The OPEC-NOPEC production cut agreement received a boost yesterday when Turkmenistan indicated that it might join in the cut agreement. Turkmenistan plans to attend the OPEC meeting on May 25th in Vienna. There appears to be a high probability that the group will decide to extend the cuts beyond the originally planned June 30 end date. Concerns remain about the persistent oversupply, however. Libyan output reportedly has risen to 800 kbpd for the first time since 2014, for example, and the National Oil Company (NOC) has stated that production could rise as high as 1.0-1.2 mmbpd if peaceful conditions prevail and the political and physical conditions allow oil to flow freely. Libya is not part of the production cut agreement.